What is DFS Vinyl Fence made with? 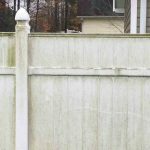 Choosing a vinyl fence can be a daunting task. There are some essential ingredients you need in your vinyl fence for it to last a lifetime. There are many different companies out there selling various qualities of vinyl fencing. 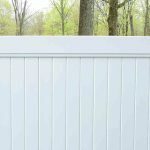 How can you know the vinyl fence you purchase is a going to look as-good-as-new for years to come? I will help you be a more informed buyer, without getting too technical. Let face it, purchasing a new fence for a your home or replacing your old fence, is an investment you don’t want to make for a long time. You work hard for your money and we want you to be happy for many years with your decision. A professional grade vinyl fence is made using virgin, non-recycled vinyl. A vinyl fence made with recycled polymers can cause the fence to break down, become brittle, yellow and shorten the life of the fence. A vinyl fence needs to be strong and able withstand ever-changing temperatures, high winds, and harsh UV rays from the sun. Vinyl fencing made of recycled plastics will not perform as good as a fence made from virgin vinyl. A quality vinyl fence will not only be made from virgin vinyl, but also have necessary additives. Recommended additives are UV inhibitors, impact modifiers and non-chalking titanium dioxide. I know these do not sound exciting, but they are essential. The titanium dioxide and UV inhibitor is what keep your fence from discolouring, chalking and yellowing. The impact modifiers give added strength to your fence. All three of these additives should be throughout the PVC and not just in specific layers. One way to explain it is solid gold versus an item that is gold plated. These additives add cost to manufacturing and in order to provide a more “economical fence”, some manufacturers use less or completely eliminate the use of additives. Just remember, not all vinyl fences are created equal.